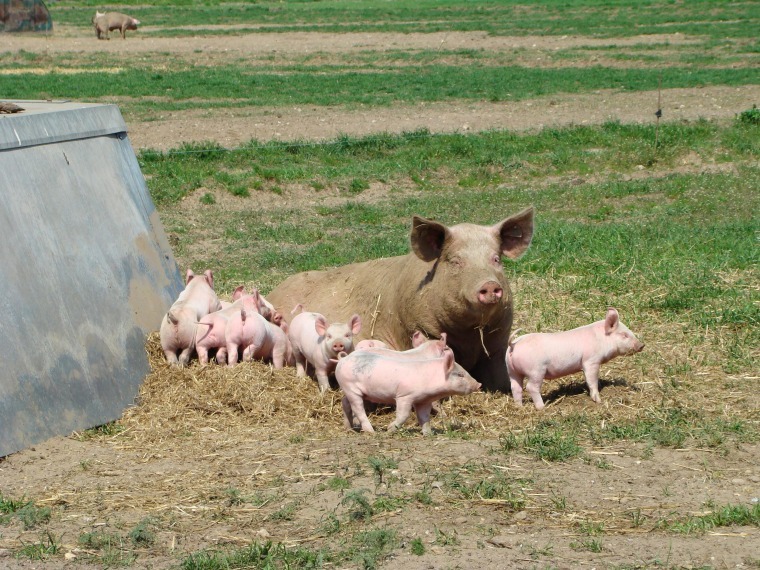 MAINZ, Germany – For a German start-up firm in Berlin, factory farming is the ‘wurst.’ Online distributor Meine Kleine Farm, or My Little Farm, is marketing packaged sausages from local farms as ‘Meat on a Mission’ and is labeling its produce with pre-slaughter photos of the pigs, cows and geese that were processed. One photo gallery shows Pig 128 under clear blues skies, pressing its pink snout into the camera lens and wandering around a muddy field with its porcine companions. A caption below the picture describes the pig as the “runaway type,” because of several escape attempts from farmer Bernd Schulz’s barnyard. According to the latest studies, Germany slaughters more than 730 million animals per year, most of them in highly industrialized production plants. “Today, shoppers have no clue where the meat in their supermarkets comes from and how far it eventually traveled,” said 36-year old Dennis Buchmann, who jokingly calls himself CPO (Chief Pig Officer) of the small company. “The farmers we work with have organic, free-range farms and breed their animals close to the consumer,” he added. Buchmann launched the project in 2011 when Germany was rocked by several food scandals, including the sales of dioxin-contaminated products and out-of-date meat. And last year German officials detected horse meat in frozen lasagna which was on sale in supermarkets across Europe – with outrage spreading from the U.K. and throughout the continent. “We need to lower our meat consumption significantly and change the way we produce meat,” said Christine Chemnitz from the Heinrich-Böll-Foundation. The organization is linked to Germany’s environmentalist Greens Party, which promoted a national ‘Veggie Day’ as part of its campaign in last year’s federal election. “We need to consume meat more sensibly, as our high meat consumption is ecologically and socially not sustainable,” said Chemnitz, one of the authors of the foundation’s annual ‘Meat Atlas’ study. For My Little Farm, which recently was recognized for its sustainable food production by the German government, it is all about transparency when it comes to the different ‘Schnitzel’ and ‘Wurst’ (sausage) variations on German consumers’ plates. Products from mixed ground meat, with pork and beef, are advertised with the slogan “Nice to Meat You” and show model-style portraits, along with short biographies of the animals that were slaughtered at local butcher shops. Despite significantly higher prices, products from organic farming are enjoying growing popularity in Germany, with some carnivores looking for more than just a photo to enhance the consumer experience. “After we first introduced our main supplier, farmer Schulz from the small town of Goemnick, we triggered unexpected pig tourism,” Buchmann said.